Preheat oven to 450 degrees and grill to high. Divide caramelized onions between two 3-inch round ovenproof earthenware "tian" dishes, spreading it to cover bottom of dish. Spread roasted garlic paste over onions. Sprinkle with chopped thyme, salt and pepper. Beginning with zucchini, completely cover caramelized onion layer with zucchini and tomato shingles, overlapping pieces slightly and alternating between the two. Drizzle with 1 tablespoon olive oil and season with thyme, salt and pepper. Sprinkle with Parmesan cheese and cover with foil. Bake for 12 minutes. Meanwhile, brush lamb with oil and season with salt and pepper. 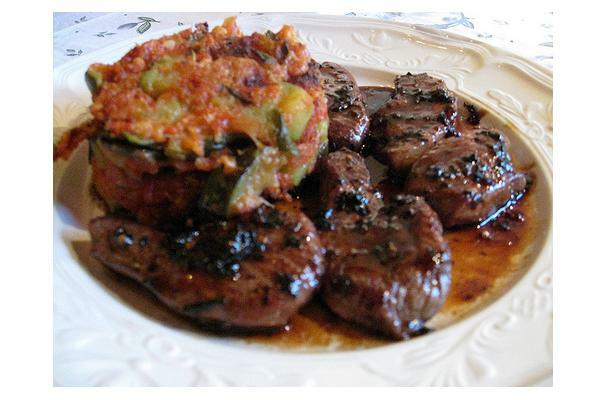 When tians have baked 6 minutes, begin lamb, grilling medallions about 3 minutes per side. Remove to a cutting board, cover loosely with foil and let sit at least 5 minutes. Remove tian from oven. Uncover, tilt carefully, and slide it out onto a dinner plate. Slice lamb and arrange it slightly off to side of tian. Garnish with chopped thyme and Parmesan cheese.